You have now logged out. Thank you for being with us today. More suggestions to dazzle your dating experience, liven up your love life, and add fizz to your friendships. Cupid.co.uk - draw back your bow - UK singles are flocking to Cupid to meet and date. DatingUK.com - are you Single? Do you live in the UK? 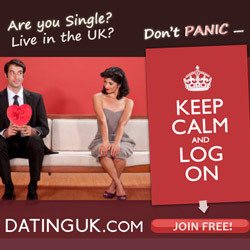 Don't PANIC - Keep Calm and Log On!